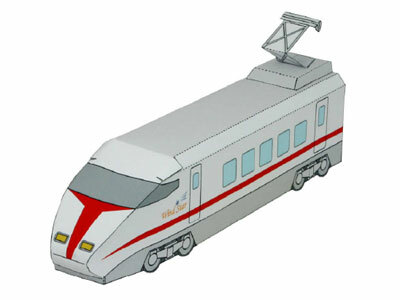 It's a simple and easy to fold train paper model. Making it is just like folding a paper box. Take out your glue, scissor or knife and printing paper to print out the pattern and you can start making it at once. It is actually the head part or front car of the train. There are another part which is middle car. Read till the last paragraph to get the link to the template. Well, you can find the banner to this express train papercraft at the bottom of the post. 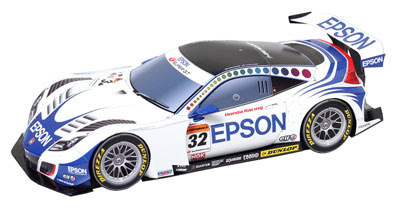 Check out this HSV-010 GT race car papercraft by Epson, a replica of GT race car that is being used in GT 2010 series. Get the free template and make one to decorate your table today. It's a new car model made in 2010 to replicate the original car used by epson team in GT500, 2010 series. The model's scale is 1:24 similar to size of model cars that you can find at stores. And for you information, geeks at epson actually managed to create a full size 1:1 replica of the Acura/Honda NSX Super GT race car once. Can you imagine it? A full size car papercraft using cardboard. You can see the making progress at this post, making a full size GT race car papercraft. Kids who like to play house can now make a replica of coffee or tea cup by using paper. Coffee cup papercraft with free template by www.sasatoku.co.jp. I think it's normal for parents to buy their kids a set of plastic kitchen utensil including pan, pot, knife and of course tea cups. Well, now I'll present you a pattern that you can use to make paper cup. Kids can enhance their creativity when making it while teachers can use it as a material for group activity at school. 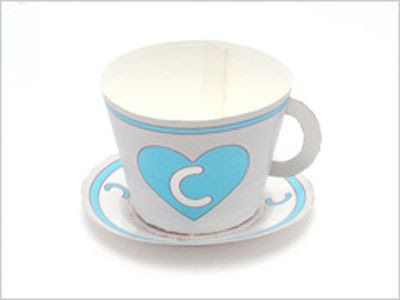 If you look at the sample, the cup has a letter 'C' on it. Yes, C for cup! 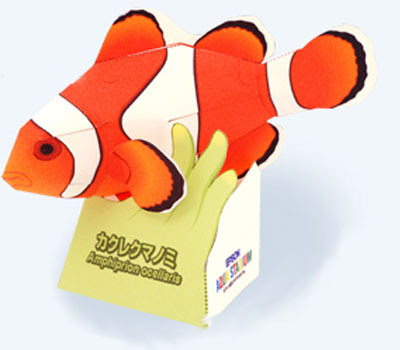 A cute clown fish papercraft by Epson Aqua Stadium. Download the free template and make one yourself today. Someone birthday is near so i would love to present you some birthday related craft. Well, because my aim is to feature various type of papercrafts thus I always choose my subjects between paper models, toys, origami, dolls and boxes. I actually made many posts about paper boxes before but I have never specifically labeled type of the boxes. So for this craft, i will place it into birthday category. 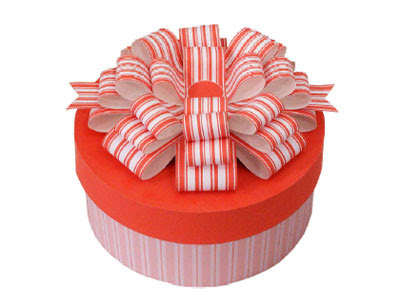 Because everybody love party and presents and it is designed specifically for it. anyway, you do not need to limit the usage, it can also be used in other events and occasions. I still remember featuring PaperBoxWorld art work before. They are animal box shape paper toys which I recommend to anyone who is looking for cute papercraft. I really love the designs because they are simple, cute but unique in its own way. I really wish I can make my own custom paper toy with unique trademark such as the one made by cubeecraft and PaperBoxWorld. It has been awhile since I make a post on pop up card. It may not be a right season but I found a cute greeting card that you can send to your friends during summer. 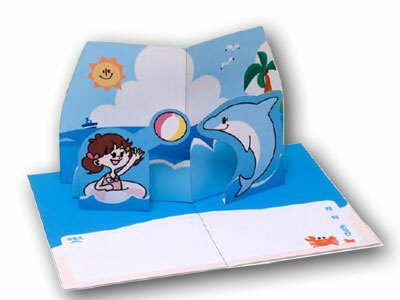 The theme is about sea with a kid swimming and playing with a dolphin on it. It is distributed freely at jp-network. There are also others such as card for christmas and simple pop up for all season. You gotta check them out yourselves. 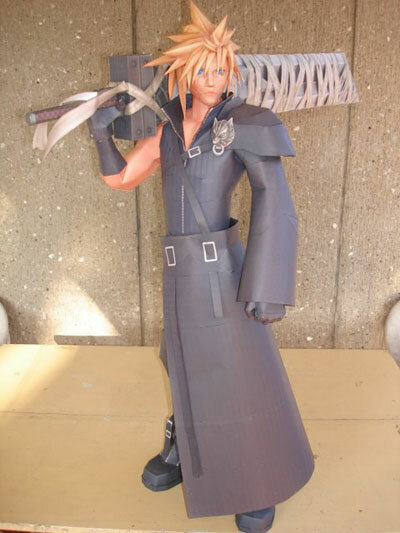 Yet another 3D version of Cloud Strife papercraft for Final Fantasy and Kingdom Heart game Fans. Free template by Fezco. Continuation from my previous post on Cloud Strife paper model, lets cheer for this awesome art work. The author mentions that this model is huge. Of course not the life-size Cloud, but larger still than normal. One good thing about a large size papercraft that it is easier to fold and assemble compare to a smaller one. Don't forget to check my previous post too, alright!